Doll Hospital Located in Sunny Southern California. Patients Seen by appointment only, so call or email us today to make an appointment or ask questions about your doll. Pictures are always appreciated to help evaluate your doll. Select buttons below for explanations and pictures of my services. 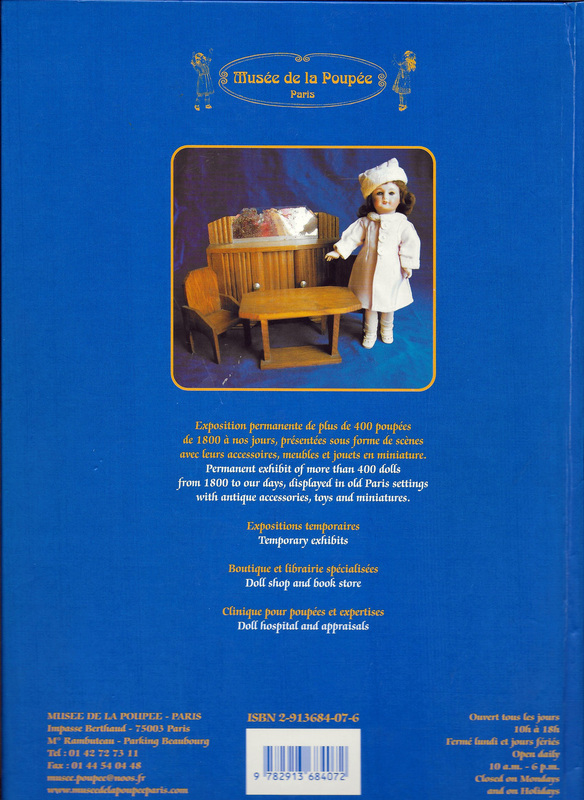 We are now making custom ordered reproduction doll furniture. 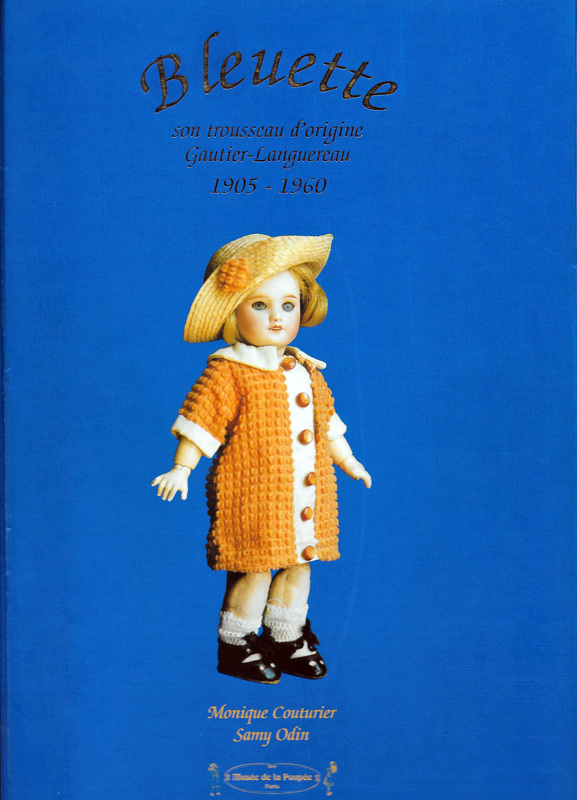 Copied from original G-L Bleuette Furniture and from the La Semaine De Suzette (LSDS) patterns. Play size furniture in 1:6 scale for Bleuette, BJD, and other 10-12" dolls. Call or email us to place an order or to get more information. 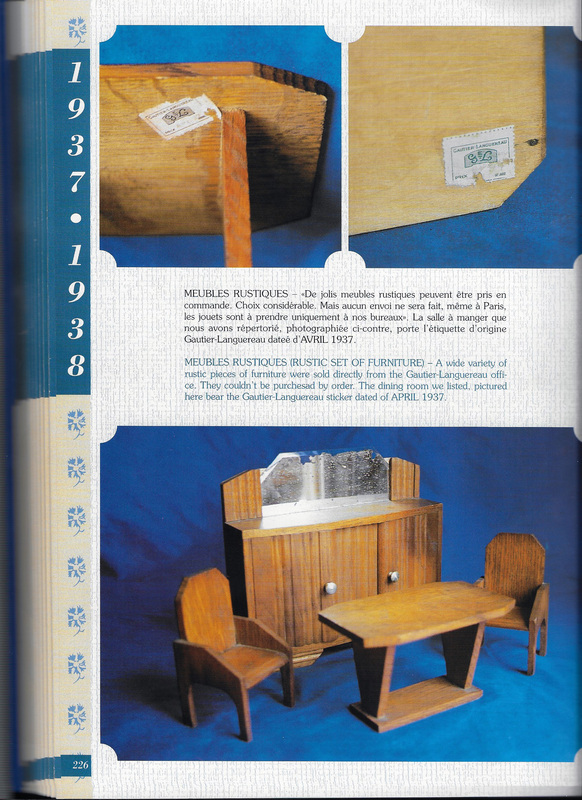 Below is our reproduction G-L furniture as pictured in Samy Odin's Bleuette book and on the back cover. This furniture is handcrafted from solid quarter sawn white oak just like the original furniture. You can purchase the buffet separately for $100, the table and 2 chairs as a set for $75, or the entire set for $150. Below is our upsized reproduction G-L furniture. We were informed that the G-L table and chairs were slightly undersized for true 1:6 scale, so we have upsized the table and chairs to be 1:6 scale. The buffet was already good in all dimensions except the depth, it could be a little deeper, but we did not change it. You can purchase the buffet separately for $100, the table and 2 chairs as a set for $100, or the entire set for $175. Below is the Fairytale themed bedroom set, faithfully crafted from patterns published in La Semaine de Suzette in the 1930s. All pieces are made from Baltic birch plywood and finished in a gloss white finish, although, you can request different colors. 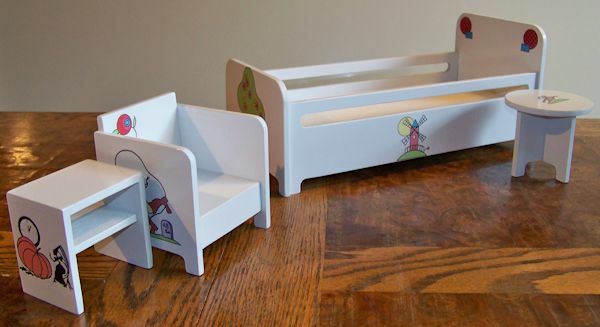 All pieces have been fancifully decorated with hand colored decals featuring the storybook artwork printed with the original patterns. Custom decals can be made to put a name on one of the pieces for an additional charge. Since LSDS never published patterns for a closet or vanity stool, we have created the pieces to complement the set. 20% discount if you purchase all pieces at the same time. Note that you can mix the pieces to meet your needs. The stool can be used as a table, the chair can be used with the vanity. We can also personalize your vanity, closet or bed with whatever name you might want to put on the pieces for an additional $5/pc. 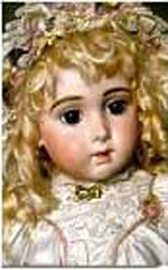 Dr Toni's Doll Repair and Doll Restoration. Learn more about Dr Toni.